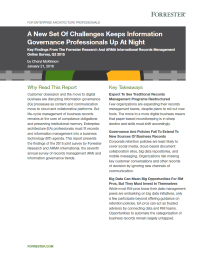 Read this Forrester report to find out how digital business is disrupting the information governance process and how the opportunities to automate the categorization of business records remain largely untapped. The move to a more digital business means a decline in paper-based recordkeeping, and an organization must adapt to meet this shift accordingly. As content and communication move to cloud and collaborative platforms, enterprise architecture professionals must fit records and information management into a business technology agenda.